Who can resist the lure of pretty lights when it’s coming up to some lovely time off work, and the planning for Christmas and all it’s celebrations? There is just something magical about seeing lots of different coloured lights twinkling away in windows on the cold wintry nights. They bring thoughts of warmth, cheer, and the excitement of Christmas yet to come. How many kids eyes pop open in wonder as they see the pretty light strung up? I know I still love to come home and see lights showing me the way home. I quite like inspirational ideas, and Xmas Direct has a nifty way of decorating stairs that I wouldn’t have thought of. It just makes me wish I had a power socket in a handy place to be able to copy this idea. 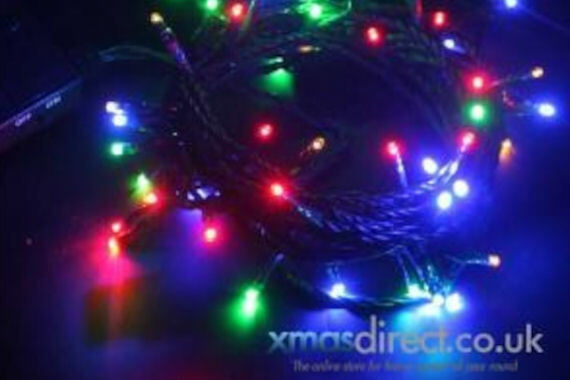 The giveaway announcement today, is for two lucky people to win a set of multi coloured Xmas lights from Xmas Direct each. To enter, simply follow the rafflecopter steps, and give yourself higher chances of entry by completing each step. If you are already doing one of the steps, that’s fine, it still applies. The lights on offer are multi coloured battery operated LED fairy lights in the traditional colours of red, blue, amber and green. The lights are set on green cable that means they can blend into dark backgrounds. Xmas Direct suggests winding them through a wreath or a garland, which seems a fairly neat thing to do. With a small battery pack that takes three AA batteries, these lights could well last up to 100 hours if you use high-powered batteries. The two sets of lights on offer are the 5 meter lengths, which are valued at £17.99 each. The promoter reserves the right to change or cancel this giveaway at any time. The winning selection will be made by random selection. Winners will be notified after the end of the entry period. If the winners don’t claim their giveaway after 48 hours, it will be redrawn. While we will try to deliver the winners goods by Christmas, we cannot absolutely guarantee that the giveaway goods will arrive in time for Christmas Day. While we will endeavour to get the lights to the winner on time, the delivery time will be dependant on how long it takes to be claimed and delivery schedules. Giveaway open to UK entrants only. I love having Xmas lights up at this time of year! So pretty, I always need more lights. It’s not Christmas without twinkly lights! I am following on twitter and liked on facebook. I think I’d put these in the window – I love fairy lights! These light sure would brighten up our home! Fantastic prize, I just can’t wait for Christmas! moving soon so df more lights needed!!! you can never have too many Christmas lights! I have them up in the bedroom, dining room and lounge and they’re up all year! Thanks for the competition! So pretty. I love Christmas lights.